Silver and gold. (Ok, stainless and bronze.) It still looks really pretty to me so I had to take a picture before these pieces get installed deep into black recess of our bilge, never to shine in the daylight again. The shaft was replaced in 2009 but when we got the new one we found it was just a little bit bigger than the old one. Like 0.10 of an inch- causing us to have constant problems with the stuffing box getting warm. Further, due to the shaft being too large and not enough water passing through the cutlass, stagnant water sat on the shaft and pitted the surface. In addition to the shaft diameter problem, when we hauled out we found that the rubber inside the cutlass bearing had come loose and blocked the waterfeed inlets on the cutlass bearing housing compounding the problem. Originally Keith had decided to replace the shaft and install a dripless cutlass bearing. However, after getting the new shaft and coupling machined to match, he thinks that the extra space with the correct diameter will most likely resolve all of the overheating problems and we are going stick with the traditional cutlass bearing. Let’s hope we are right. 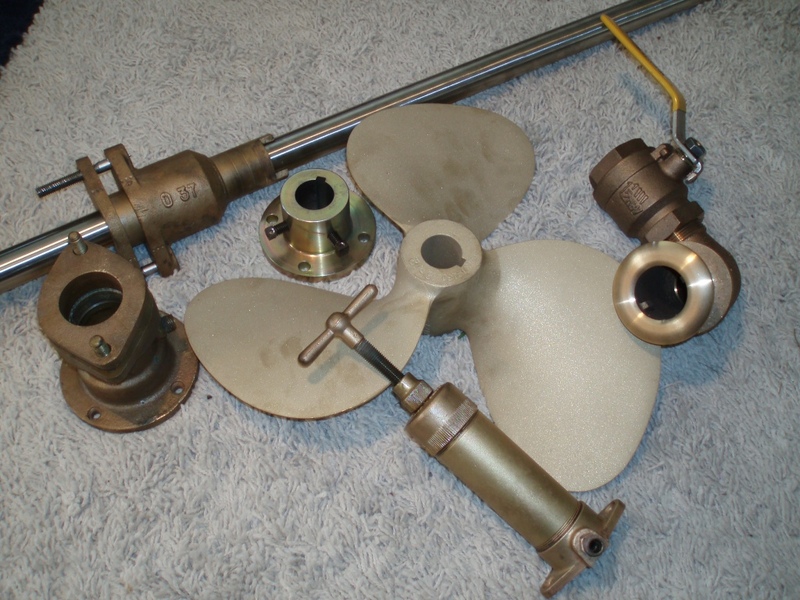 Those other shiny parts are the new exhaust through hull, rudderpost cutlass, and oil pump for the rudder. Oh, and of course the newly pitched prop. The goal is to get all of this installed this weekend.